They are single parents and large families, many still working long hours to keep the nation's airports and prisons secure. One mom says she is skipping meals so her kids can eat. Another says she is "falling apart." "I have no money," says T. Miller. "I don't know how much longer I can stay on this job." Miller is a newly minted Transportation Security Administration officer who works at a busy airport in the Washington, D.C., area. NPR isn't using his full name because the TSA doesn't allow its employees to speak publicly. He became a government employee last December and makes about $32,000. Miller makes much less than most federal workers in his region. In the areas surrounding D.C., such workers tend to have high salaries — $95,212 is the average for Virginia — and those working in lower-income jobs are spread throughout the country. In some states with high numbers of federal employees affected by the shutdown, low pay combined with higher costs of living make it even more of a challenge for those who suddenly find themselves without a paycheck. Elizabeth Kandror, a clerk with the Fish and Wildlife Service in Homer, Alaska, makes about $37,000 per year. She has been a federal employee for three years, and she says she didn't expect the shutdown to last this long. "It's so unbelievable," she says. "This is what we've come down to — the 'greatest nation' on earth?" she asks, her voice rising. After Washington, D.C., Alaska has the highest percentage of civilian federal employees who work for agencies affected by the shutdown in a single state: 14 per 1,000 Alaska workers, according to data from the Office of Personnel Management and Bureau of Labor Statistics. Its cost of living is also among the highest in the country, according the Commerce Department's "price parity" index. And yet the average paycheck for federal employees there is near the middle of all states: about $77,000 a year. There is a caveat: The Bureau of Labor Statistics doesn't break out how much federal employees make in different agencies. So the wage data available include both workers affected and not affected by the shutdown (some agencies like the Department of Defense and Department of Labor have been funded by Congress for the current fiscal year). The majority of those affected by the shutdown in Alaska work for the Interior and Transportation departments. 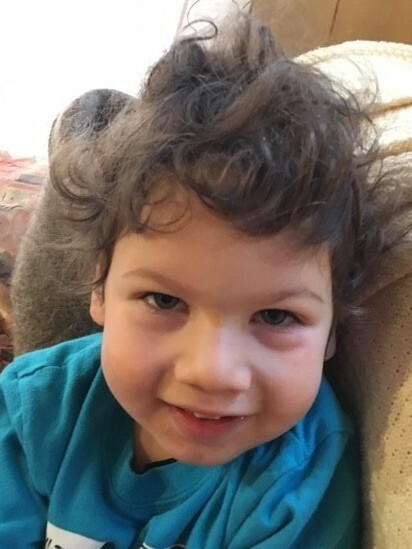 Three-year-old Ruslaan Kandror's mom, Elizabeth Kandror, is furloughed and worries she won't have enough funds to keep him enrolled in day care. "I did file for unemployment and got $300," Kandror says. That will help them get through the end of the month. The single mom says she is fortunate not to have rent payments because she lives in a cabin on her parents' land. But she, too, lives paycheck to paycheck, and if the shutdown continues beyond January, she says she will probably have to go on welfare. Kandror is the mother of a 3-year-old boy. She says she has funds to pay for day care next month, but that's about it. She had to wait nine months to get her son in day care and fears losing that spot if she can't pay. She says she will need to find other work, but it will be hard because Homer is a seasonal town and there aren't a lot of jobs in the wintertime. "That's why I was so grateful to get this federal job — because it's year-round," she says. To be sure, not all areas with high concentrations of federal employees are taking home smaller paychecks. Maryland and Virginia, home to many federal workers in the D.C. suburbs, are the two states where they make the most on average: $107,536 and $95,212, respectively. 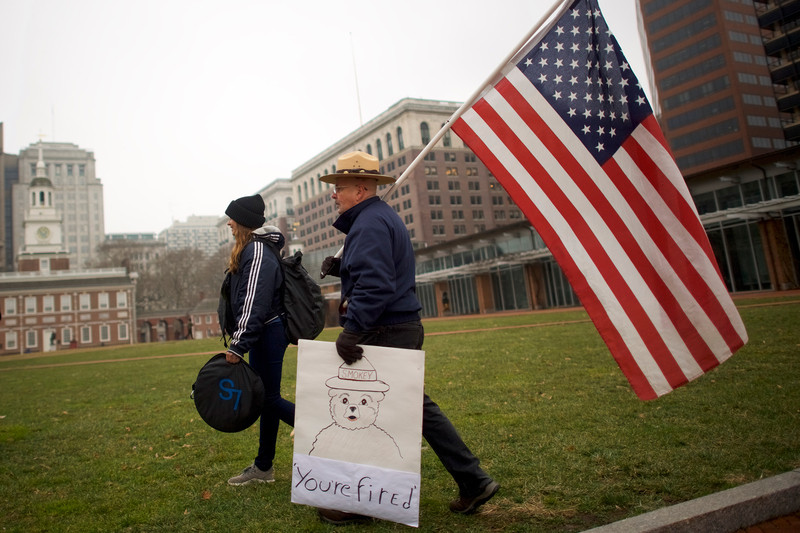 David Fitzpatrick, 64, a park ranger, holds an American flag and a placard stating "You're fired" after a rally with furloughed federal workers in front of Independence Hall in Philadelphia. About 14 percent of federal employees make under $50,000 a year, according to government data. Amy Fellows is a 33-year-old single mom of three kids — ages 10, 3 and 1. She has been skipping meals for days now to make sure her kids have enough to eat. Fellows is a correctional officer in Arizona and works for the Federal Bureau of Prisons making $49,000 a year. She is also working with no pay because she is considered essential — sometimes clocking in a 16-hour day. "I want to make sure my kids have that food," says Fellows. "I was able to pay for my rent and my utilities, but now I have nothing in my bank." Actually, she is already in the red — her bank account has a negative balance of $400. "I've actually had to call out three times because I can't afford day care," she says. Day care is $200 a week for her two youngest kids. She often feels like having to choose between staying home and taking care of her two youngest children or going to work. She is worried about losing her job. Federal employees will get back pay when the government reopens. But until then, many are part of the 40 percent of Americans who would not be able to afford an unexpected $400 expense, according to Elise Gould of the Economic Policy Institute. They are completely dependent on every single bimonthly paycheck to cover the basics — rent, utilities and food. Jacinda's husband is a TSA screener in Oregon. NPR is not using her last name or her husband's name because TSA forbids personnel to speak publicly. When Jacinda first spoke to NPR last week, she was worried about how her family would survive. NPR reached out again this week, and she says she has only grown more anxious and desperate. "I'm falling apart," she says. "I genuinely believed this would be over this week." The couple has two kids — a soon-to-be 4-year-old boy and a 6-month-old girl. The single-income family lives paycheck to paycheck — and says missing a second paycheck would be dire. "I feel so out of control," Jacinda says. "It's hard to even articulate how angry and frustrated and pissed off I am that my husband is working full time and we're like terrified to lose our house." The couple desperately needs a paycheck to pay for rent, she says, or they fear they will be evicted. "Most of our bills are not getting paid," Jacinda says. "I've started to get phone calls from collectors now for the credit card bills." She says she has explained their situation to the collectors, but they keep calling. 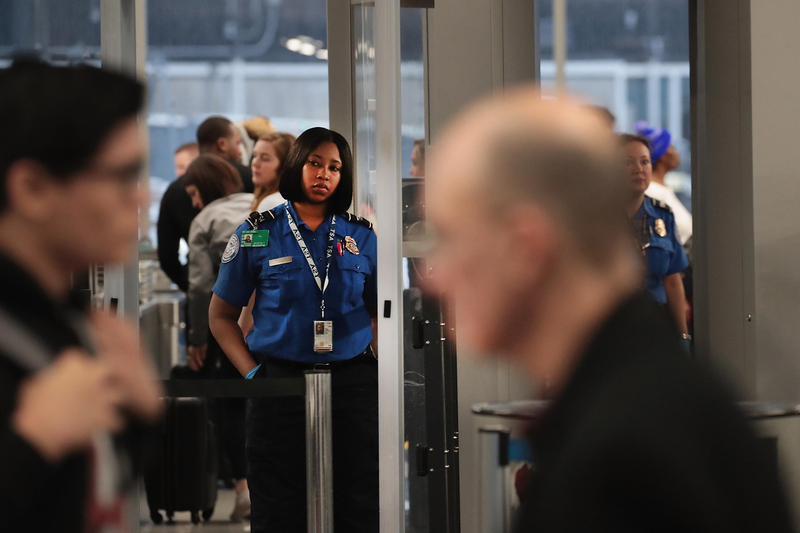 A Transportation Security Administration worker screens passengers and airport employees at O'Hare International Airport in Chicago earlier this month. Federal contract workers are also feeling anxious and uncertain. Unlike government employees, contractors will most likely not get back pay once the government reopens. Zachary Schindler is a federal contractor at the Earth Resources Observation and Science Center in South Dakota. He's a cook in the cafeteria — one of the hardest-hit sectors because they are typically minimum-wage employees, often with few or no benefits. "I'm falling behind," says Schindler. He has been on the job for about three years, and he and his wife had built a cushion toward buying a house. But their savings are now gone, he says, and they are "just living paycheck to paycheck again." They have car loans, rent, mobile phones, utility and food bills. "We are struggling to see how we are going to pay our next bills," he says. Schindler, 29, and his wife are the parents of a 2-year-old son. They had to pull him out of day care because they could no longer afford the $400-per-month fee. Schindler says he is staying away from news, especially political news. "It makes me angry," he says. "I'm applying to anything I can," including jobs outside his expertise, like county appraiser. Just not the federal government. People like Schindler could feel the shutdown pain even more deeply if it drags on even further, says Paul Light, professor of public service at New York University who studies the workforce. He estimates that 4.1 million people work under federal contracts (there is no national database that tracks these workers). He says it is people who work for small companies, like cooks on contract, who may lose their jobs entirely because of the shutdown. "That's where you would expect to see some pretty significant impacts of even a two-week shutdown," says Light, "because the smaller the business, the more likely it is to lay off workers at the first sign that there might be a delay in payment." "I'm not sure how they'll recover if this shutdown continues much longer," he says. Zoo workers enter the Smithsonian National Zoo earlier this month. The main gate is closed to the public. 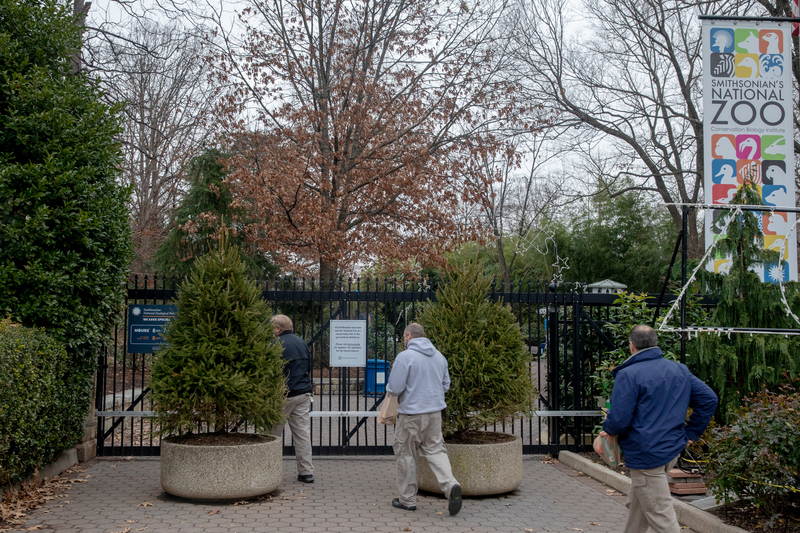 The zoo is one of the many D.C. attractions that have been forced to close or scale back because of the shutdown. Many federal workers and contractors NPR spoke to expressed frustration at the Trump administration and Congress for allowing the shutdown to persist. Kandror, with the Fish and Wildlife Service in Alaska, says she has called her two senators to express her frustration but hasn't heard back. "I feel like my life has been hijacked," she says. She wants both parties to work together for a solution, she says, "but not on our backs." Fellows, the correctional officer in Arizona, says she feels politicians are thinking only of their own political gain. Miller, the TSA officer working in the Washington, D.C., area, is one of many federal workers now looking for a new job. He says he has already called his former boss and has applied to other jobs as well. "I have to have Plan A, B and C in motion," he says. Plan A is hanging on to his government job, Plan B is going back to his gym work and C is work elsewhere. He takes a long pause and a deep breath before he says, "I can hang on to this job for about two more weeks" and that's a stretch, he says. If the shutdown isn't resolved after that — "it's the no-turning-back kind of phase." "My expenses are low," Miller says, but he has bills to pay — like credit cards, a car loan and college loans. He has been in contact with his creditors, and though he says they are giving him an extension, he doesn't know for how long. He says he feels fortunate compared with other TSA colleagues but is still worried. "I feel like I'm going backwards," he says. Miller graduated from college in 2004 and worked as a physical trainer at a local gym for seven years with no benefits and no retirement. He joined TSA "because the government is the most stable employer." "I had big dreams for this job," he says. "I went into it planning to make it a career." He says he planned to use his entry-level job as a steppingstone in what he envisioned as a long career. The government offers good benefits, he says, but working without pay is raising his anxiety level. It was never part of Miller's plan.